Product designers use Design Thinking to build products and services. Can we use it to reimagine roles from the employees point of view? Redesign roles creatively. Why wait for someone to do it? Try doing it for yourself. To be able to start enjoying the role, you have to bring in your full self to work. It is an exercise in creativity and not about rewriting the job description. So grab a piece of paper and pen (I love using coloured markers and crayons when I do this) and start with the basics. ‘WHY’ does your role exist? Simon Sinek's talk made this question famous. Start with ‘WHY’. How and what will follow from there. 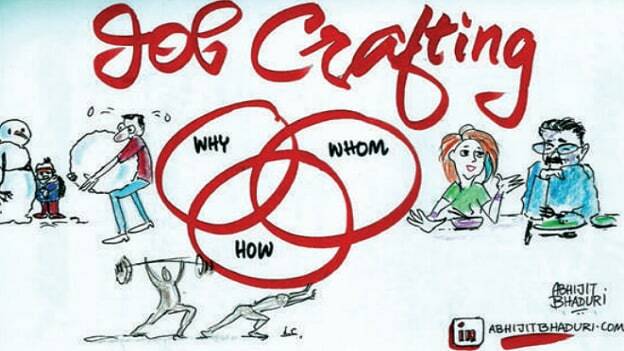 The ‘WHY’ is the base of your role design. Ask yourself, why was this role created in the organization? Talk to people and get a view. These people could be your customers (yes, especially internal customers) and leaders from other departments. Ask: Why does the organization has a role that you occupy? Is the way your role being managed and executed meeting the higher organizational purpose? Who will bellow if your role were to disappear? These are hard questions to answer but the best questions to start with. Asking the ‘WHY’ question is how great leaders inspire action. ‘HOW’ will this role make a difference? Once you have asked yourself the ‘WHY’ question, you probably have a good view of why your role exists. Your customers, peers, and other colleagues have given you their views of what the role does and could do along with what it does not. Based on this information, ask yourself ‘HOW’ your role can be redesigned. Think about ‘HOW’ your role can make someone successful or happy. Think of what is it you could do to make a difference. Think about the deeply held beliefs you have about work. Research shows that "deeply embedded life interests are long-held, emotionally-driven passions, intricately entwined with personality and thus born of an indeterminate mix of nature and nurture. Deeply embedded life interests do not determine what people are good at — they drive what kinds of activities make them happy. At work, that happiness often translates into commitment." ‘WHAT’ do you need to do in this role ... differently? Imagine you are interviewing someone for the job that you do. What are the skills would you need? Which is the skill you use every day? What skills do you use once a month? What skills do you use infrequently (maybe, once a year)? What new skills do you wish you could use in your role? Bringing in your knowledge and skills fully is a great way to create meaning. Hobbies are an important part of designing your role. They make your role so unique that it is impossible to start thinking of the role without you. What are the hobbies you have had? Can you bring in some of them to put a unique touch to your role? Change the way you view the role i.e. ‘WHY’: An L&D person’s view of his/her role as "helping people become successful in their careers" will change the way another person views the role. That goes far beyond "run the training programs". Change the way you interact with others i.e. ‘WHO’: When a coder starts teaching his colleagues a new software language, it changes the nature of the relationships that surround him. Change the tasks that make up the role i.e. ‘HOW’: Bringing my passion for writing and drawing to my role really made it ever so satisfying for me. I drew cartoons on my slides instead of using stock photos. Have you tried redesigning your role? Do share those ideas here in the comments. It might inspire someone to look at their role in a totally different light.